Perhaps his most significant contribution to military strategy, though, came from a series of briefings he gave. In them, Boyd laid out a way of thinking about conflict that would revolutionize warfare around the world. The idea centers on an incredible strategic tool: the OODA Loop — Observe, Orient, Decide, Act. Nation-states around the world and even terrorist organizations use the OODA Loop as part of their military strategy. It has also been adopted by businesses to help them thrive in a volatile and highly competitive economy. The OODA Loop is an oft-cited, but typically misunderstood idea. If you’ve heard of it, it was most likely presented in a fairly superficial way – as a 4-step decision-making process where the individual or group who makes it through all the stages the quickest, wins. That’s one element of the OODA Loop, but there’s much more to it than that. As you look through these materials, you quickly learn that a lot of hard thinking and philosophizing went into the development of the OODA Loop. Boyd combined a deep understanding of military history and strategic thinking with a wide range of other intellectual domains and theorems, including quantum mechanics, cybernetics, chaos theory, Popperism, and Neo-Darwinism. For this reason, to truly understand the OODA Loop, one must be familiar with the scientific and philosophical developments that helped create it. Thus, once you move past the simplified, Cliff Notes version of the OODA Loop, you find that it’s actually pretty heady stuff. It’s not “groundbreaking” in the sense of revealing insight never before conceived; rather, its power is in the way it makes explicit, that which is usually implicit. It takes the basic ways we think, decide, and operate in the world — ways that often get confused and jumbled in the face of conflict and confusion — and codifies and organizes them into a strategic, effective system that can allow you to thrive in the heat of battle. It is a learning system, a method for dealing with uncertainty, and a strategy for winning head-to-head contests and competitions. In war, business, or life, the OODA Loop can help you grapple with changing, challenging circumstances and come out the other side on top. I have spent the last month diving deep into the OODA Loop – reading everything available on it, from Boyd’s briefing notes to biographies to analyses of the theory by other authors. I also met with Curtis Sprague, a former U.S. Air Marshal and Lead Instructor at the Federal Air Marshal School in Dallas, and an avid student and instructor of the OODA Loop, to get his insights. Below you will find a synthesis of what I have learned. My goal is to provide the most thorough, but also accessible primer on the OODA Loop out there. To begin your journey in mastering the “Tao of Boyd,” read on. According to Boyd, ambiguity and uncertainty surround us. While the randomness of the outside world plays a large role in that uncertainty, Boyd argues that our inability to properly make sense of our changing reality is the bigger hindrance. When our circumstances change, we often fail to shift our perspective and instead continue to try to see the world as we feel it should be. We need to shift what Boyd calls our existing “mental concepts” – or what I like to call “mental models” – in order to deal with the new reality. Mental models – or paradigms – are simply a way of looking at and understanding the world. They create our expectations for how the world works. They are sometimes culturally relative and can be rooted in tradition, heritage, and even genetics. They can be something as specific as traffic laws or social etiquette. Or they can be as general as the overarching principles of an organization or a field of study like psychology, history, the laws and theories of science and math, and military doctrines on the rules of engagement. Because Boyd was more interested in using the OODA Loop as an organizing principle for a grand strategy, he tended to focus on these more abstract types of mental models. While our paradigms work and match up with reality most of the time, sometimes they don’t. Sometimes the universe pitches us a curveball that we never saw coming and the mental models we have to work with aren’t really useful. If someone runs a red light, or kisses us in greeting instead of shaking our hand, we are surprised and momentarily thrown off our game. If an archaeologist were to uncover evidence that humans rode around on dinosaurs, previous theories on the earth’s history would be thrown into disarray. Gödel’s Incompleteness Theorems. Boyd inferred from Gödel’s Incompleteness Theorems that any logical model of reality is incomplete (and possibly inconsistent) and must be continuously refined/adapted in the face of new observations. However, as our observations about the world become more and more precise and subtle, a second principle kicks in which limits our ability to observe reality correctly: Heisenberg’s Uncertainty Principle. Heisenberg’s Uncertainty Principle. In a nutshell, this principle shows that we cannot simultaneously fix or determine the velocity and position of a particle or body. We can measure coordinates or movements of those particles, but not both. As we get a more and more precise measure of one value (velocity or positions), our measurement of the other value becomes more and more uncertain. The uncertainty of one variable is created simply by the act of observation. Applying this principle to understanding the world around us, Boyd inferred that even as we get more precise observations about a particular domain, we’re likely to experience more uncertainty about another. Hence, there is a limitation in our ability to observe reality with precision. Take the case of Kodak. Even though the company invented the core technology used in digital cameras today, they were so focused on traditional film that they failed to see that the emerging trend towards digital would ultimately consume the photo industry. By holding to their mental model that traditional film would always be around, they missed the fact that the landscape was rapidly shifting around them, eventually leading to the storied company having to file for bankruptcy. 2nd Law of Thermodynamics. Applying the Second Law of Thermodynamics to understanding reality, Boyd infers that individuals or organizations that don’t communicate with the outside world by getting new information about the environment or by creating new mental models act like a “closed system.” And just as a closed system in nature will have increasing entropy, or disorder, so too will a person or organization experience mental entropy or disorder if they’re cut off from the outside world and new information. The more we rely on outdated mental models even while the world around us is changing, the more our mental “entropy” goes up. Think of an army platoon that’s been cut off from communication with the rest of the regiment. The isolated platoon likely has an idea, or mental model, of where the enemy is located and their capabilities, but things have changed since they last talked to command. As they continue to work with their outdated mental model against a changing reality, confusion, disorder, and frustration are the results. The crux of Boyd’s case for why uncertainty abounds is that individuals and organizations often look inward and apply familiar mental models that have worked in the past to try to solve new problems. When these old mental models don’t work, they will often keep trying to make them work — maybe if they just use an old strategy with more gusto, things will pan out. But they don’t. Business magnate Charlie Munger calls this tendency to use the familiar even in the face of a changing reality the “man with a hammer syndrome.” You know the old saying: “to the man with only a hammer, everything is a nail.” So it is with folks with one or two mental models to work with. Every problem can be solved with their current way of thinking. And so they keep hammering away, confused and disillusioned that their work isn’t producing any results. So how do we overcome this uncertainty or mental entropy? It was a question that John Boyd spent his entire life (up until the day he died) trying to answer. The OODA Loop was the result. Or put another way, the OODA Loop is an explicit representation of the process that human beings and organizations use to learn, grow, and thrive in a rapidly changing environment — be it in war, business, or life. Much more complex than the simple four-step diagram, huh? 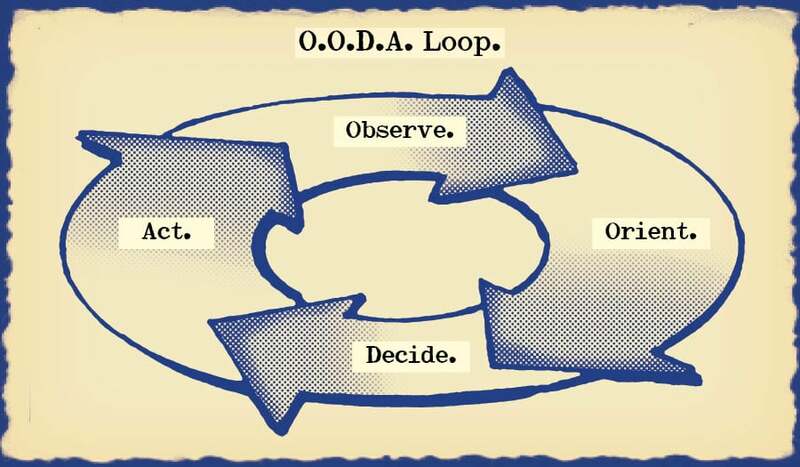 To the uninitiated, Boyd’s full vision of the OODA Loop can look like a bunch of gobbledygook. But once you understand the thinking and philosophizing that went into creating this diagram, you’ll soon realize how incredibly insightful and profound it is. Below, I take you on a deep journey through John Boyd’s OODA Loop. My goal is to show you that it isn’t merely the simple four-step decision-making tool it is often seen as, but rather is in many respects a tao, or way of thinking, about the world in order to deal with uncertainty (or in other words, life!). Once you understand the Tao of Boyd, you’ll find yourself using it more and more in your daily life. The first step in the OODA Loop is to observe. This is the step that allows us to overcome the 2nd Law of Thermodynamics. By observing and taking into account new information about our changing environment, our minds become an open system rather than a closed one, and we are able to gain the knowledge and understanding that’s crucial in forming new mental models. As an open system, we’re positioned to overcome confusion-inducing mental entropy. Start keying in on where all the exits are whenever you enter a public building. If, heaven forbid, a person enters with guns blazing, you want to know where their possible entry and exit points are and you want to know where your closest exits are located. Give the people around you the once over and be on the lookout for behavior that doesn’t seem “normal.” Normal will depend on the situation and environment (having adequate mental models will be important in determining baseline behavior — see “Orient” below), so just because someone is acting weird doesn’t necessarily mean they’re a threat. Just keep them on your radar. From a big picture strategic level, say, running a successful business, observation will require you to keep track of not just your gross revenue, expenses, and profit, but also larger trends that may or may not affect your bottom line. Reading trade journals or blogs related to your business should be part of your regular observations, as well as simply talking to other business owners in not only your own industry but also those that affect yours. For example, while I should obviously have a depth of knowledge about blogging, I also need to know about web hosting, net neutrality, and other more technical issues that ultimately affect how AoM runs and operates. The most important step in the OODA Loop, but one that often gets overlooked, is Orient. Boyd called this step the schwerpunkt (a word he borrowed from the German Blitzkrieg), or focal point of the loop. So how does one orient himself in a rapidly changing environment? You constantly have to break apart your old paradigms and put the resulting pieces back together to create a new perspective that better matches your current reality. “Imagine that you are on a ski slope with other skiers…that you are in Florida riding in an outboard motorboat, maybe even towing water-skiers. Imagine that you are riding a bicycle on a nice spring day. Imagine that you are a parent taking your son to a department store and that you notice he is fascinated by the toy tractors or tanks with rubber caterpillar treads. Boyd then challenged his audience to imagine what emerges when you put these particular parts together. Orienting, in a nutshell, is the ability to make figurative mental snowmobiles on the fly and in the face of uncertainty. It’s important to point out that deductive destruction and creative induction of mental models isn’t a one-time event. For Boyd, it’s a continual process; as soon as you create that new mental concept, it will quickly become outdated as the environment around you changes. So if Orientation is the key to successfully implementing the OODA Loop, how can we become better at it? 1. Build a robust toolbox of mental models. Doctrines have the tendency to harden into dogmas, and dogmatism has the tendency to create folks with “man with a hammer syndrome” – it causes people to keep trying to apply that same old mental model even if it’s no longer applicable to the changing environment. You see “man with a hammer syndrome” in businesses that stick to a tried and tested business model even though the market is moving in another direction. Kodak, as mentioned above, is a perfect example of this. So too is Blockbuster. They continued making hard-copy movie rental a primary part of their business even though more and more consumers were streaming movies via the internet. Blockbuster eventually tried to shift their business model, but it was too little, too late. You also see “man with a hammer syndrome” in folks who discover some pet theory and start applying it to every. single. situation in life without considering other factors. People who are fans of evolutionary psychology are prone to this. To them, all human behavior can be explained by it. Why are men more jealous than women? Because in primitive times they couldn’t know if they were really the father of a baby or not. Why do we get depressed? It used to help people concentrate on their problems and figure out how to remove themselves from a bad situation. While our evolved psychology certainly plays a big role in our behavior, other factors are also involved in why we do what we do. It’s foolish to discount those. The more doctrines, or mental models, we have at our mental fingertips, the more materials we have from which to construct our figurative snowmobiles. So all this talk of having multiple mental models begs the question: what sort of models should you put in your toolbox? Boyd emphasized that his list was of course not exhaustive and that other mental concepts should be pursued as well. In other presentations, Boyd hinted that biological evolution and quantum mechanics are additional mental models every master strategist should have a grasp of. I would personally add philosophy, literature (and its accompanying models of interpretation), and basic common law principles (like torts, contract law, and property law) to the list. Because Boyd and Munger are thinking “Big Picture,” their mental model examples are purposely general and abstract. But it’s important to remember that mental models can be specific and concrete. To thrive in your job, you’ll need certain mental models specific to your career. To survive a lethal encounter, you’ll need certain mental models unique to tactical situations. Learn as many mental models as you can, and create as exhaustive a lattice work as possible, so you have more to work with in the creation and destruction process. Some of these subjects can certainly be intimidating for people with no experience in them. To get started, take a look at the resources section in our article on lifelong learning – particularly the online courses. Coursera, for instance, has a number of introductory classes on calculus, econ, competitive strategy, etc. 2. Start destroying and creating mental models. Perhaps there’s a principle from engineering, the works of Plato, and biology that can help create a new mental model that matches up with your new reality. Start a journal with your destruction and creation experiments. Suss out new mental concepts with writing and doodles. You may be surprised by the insights you’ll gain from this exercise. As you practice destroying and creating mental models, you’ll find that it will become easier and easier to do on the fly. It will become almost intuitive. In Mastery, Robert Greene described the great military strategists from history as having a “fingertip feel” for knowing how to proceed on the battlefield. These great strategists simply were effective and efficient at orienting. They didn’t have to deliberately think about the process, they just did it. That should be your goal. Because the world around you is constantly changing, orientation is something you can never stop doing. “ABO = Always Be Orienting” should become your mantra. Make it a goal to add to your toolbox of mental models every day, and then immediately start atomizing those models and fashioning new ones. 4. Try to validate mental models before operation. Ideally, according to Boyd, you want to be fairly confident that your mental models or concepts will work before you actually need to use them. This is especially true in combat or life-or-death situations where rapid cycling of the OODA Loop is crucial (more on tempo below). How do you validate mental models before operation? You study what mental concepts have and haven’t worked in similar situations and then practice, train, and visualize using those mental concepts. Think of the situation where a basketball team is losing the game by one basket, there’s just seconds left on the clock, and they’re inbounding the ball. They’ve already spent weeks practicing specific plays designed for these specific circumstances and now they just have to execute that plan. Having field-tested mental concepts at the ready is important even when time isn’t of the essence. In business, you can read case studies of what has and hasn’t worked for other companies and have models, concepts, and strategies at the ready that you can implement immediately when similar situations arise. Of course, if those don’t work, you’ll need to continue the process of orientation until you create a new mental model better suited for the situation. When your observations about your environment match up with certain proven mental models, you don’t have to do any destroying and creating, you just have to act. If you look at the complex diagram of the Loop above, you’ll notice that Boyd makes room for the ability to skip the “Decide” step — note the line that goes from “Orient” to “Act” and bypasses “Decide.” Boyd called the ability to quickly orient and act, “Implicit Outcome and Control.” It’s something similar to the “fingertip feel” Greene talks about. A person who has achieved mastery in a specific domain should be able to quickly notice when reality lines up with a specific mental model and then execute that mental model without having to decide. You just act. I can’t hit home hard enough the importance of the orientation step. It’s at the heart of the OODA Loop and is what determines your successful implementation of it. If you don’t act with the mental model that matches up closest to your environment, you’re going to lose no matter how quickly you cycle through the Loop. ABO = Always Be Orienting. Consequently, when we decide which mental model(s) to use, we’re forced to settle for ones that aren’t perfect, but good enough. Action is how we find out if our mental models are correct. If they are, we win the battle; if they aren’t, then we start the OODA Loop again using our newly observed data. Ideally, you’ll have multiple actions/tests/experiments going on at the same time so that you can quickly discover the best mental model for a particular situation. In war, this might mean having multiple attack points that are using different weapons systems. When the strategist discovers which targets and weapons are providing the best results, he’ll direct his attention to the winning mental model and exploit it to the max until it no longer works. Once he observes that it is no longer effective, he’ll orient more mental concepts, decide to use one or several of them, and quickly act to test them out. Over and over this process goes until the enemy is eliminated. The same goes in business. Ideally, you’ll want to try out different strategies at the same time to see which ones work. A/B testing is a good example of this. In A/B testing, marketers or online publications will come up with multiple headlines or copy (orientation!) and deploy them on different segments of their audience at the same time. They’ll then sit back and watch which headline, message, etc. performs the best. Whichever headline gets the most clicks will then become the default. Throughout this post, we’ve been talking about the OODA Loop largely as a learning system that can be employed in any uncertain situation in order to figure out the best course of action to take and how to proceed. It can guide our individual actions and doesn’t require an “opponent” per se in order to be useful. But the tool can also be used in situations of conflict and competition, where it’s your OODA Loop going head-to-head against someone else’s. Indeed, this is what the OODA Loop is most famously employed for. Each individual or group is trying to work its way through the Loop more quickly and effectively than their competitors. For this reason, understanding the basic principles for how the OODA Loop works isn’t enough to successfully implement it. Tempo is also a vital underlying element. When I met with Curtis Sprague, former US Air Marshal and instructor, he told me that there are two general principles to keep in mind when considering tempo and the OODA Loop. First, the individual or organization that can go through successful, consecutive OODA Loops faster than their opponent will win the conflict. Second, rapid OODA Looping on your part “resets” your opponent’s OODA Loop by causing confusion – it sends them back to square one; back to the observation phase; back to figuring out how to proceed. This delay provides you more time to complete your OODA Loop before your opponent does. For example, when Boise State busted out three trick plays — the hook-and-lateral, the Statue of Liberty, and the halfback toss – during the 2007 Fiesta Bowl, it reset the University of Oklahoma’s OODA Loop (along with that of the entirety of the Sooner Nation); OU was caught flat-footed and couldn’t re-orient quickly enough to surmount the Broncos surge. So what’s the best mental model in that situation? According to Curtis, as well as research on past active shootings (or active murders, as Lt. Col. Grossman calls them), the best response isn’t to flee or hide from the gunman, but rather to immediately close the gap between you and him and incapacitate him. In fact, this is what Homeland Security recommends when the shooter is relatively close to you. So fast cycling of your OODA Loop can allow you to get inside, or reset, your opponent’s, which allows you to complete your Loop first and win the fight. Speed is relative in the OODA Loop. You just have to be faster than the person you’re competing against. But simply cycling through your OODA Loop as fast as you can is an incomplete picture of tempo. What often gets overlooked by folks studying the OODA Loop is that when Boyd talked about rapid tempo, he often meant rapid changes in tempo. He argued that when it comes to winning a competition or conflict, our actions need to be surprising, ambiguous, and varying; speeding up and slowing down your actions quickly and irregularly can create confusion just as much and sometimes more than simply blowing through your OODA Loop. If the enemy is expecting a sudden and quick attack from you, but you instead delay, you may cause your enemy to have an “uhhh…” moment that can be exploited. What’s more, when you move from a boots-on-the-ground tactical level to a bigger picture strategic level, Boyd puts less emphasis on fast OODA Looping and instead focuses on developing the best mental concepts possible to win the battle or war. It’s at this “big picture” level, when a strategist is playing the long-game, that he takes into account domains like politics, culture, economics, diplomacy, and espionage. In this long game, his time interval to complete the OODA Loop becomes longer. He still has to complete his strategic Loop before the enemy’s or competitor’s, but he has a longer timeframe to do it compared to the foot soldier that’s actually engaged in the heat of battle. The OODA Loop makes explicit our implicit decision-making process. By making it explicit, Boyd offered an incomparable strategic tool to everyone from soldiers and militaries to businesses and sports teams to social movement leaders and political campaigners to better manage their own decision-making processes. It also allows the manipulation and control of the decision-making process of our competitors. Controlling both your own and your enemy’s OODA Loops allows you to come off conqueror. In addition to being a tool to vanquish your foe, the OODA Loop is a learning engine that allows an individual or organization to thrive in a changing environment. I’ve even been able to apply the OODA Loop to better understand current affairs. Take what’s going in Ukraine or in the Middle East with ISIS. The actions by Putin (invading a sovereign country) and ISIS (beheading journalists, etc.) have caused the U.S. and other Western countries to have an “uhhhh..” moment. Putin and ISIS have effectively reset America’s OODA Loop through quick and unexpected actions. Putin effectively employs unpredictable tempo – making quick moves, or saying bold things, and then appearing to draw back. Western politicians and militaries are having to come up with new mental models or strategies for how to react to a powerful country invading another, as well as needing to figure out how to respond to an amorphous terrorist organization that wants to fly their flag from the top of the White House. As some Joe Schmo, I have no influence on how things turn out in those political and military arenas, but it’s interesting nonetheless to see the OODA Loop play out on the world stage. Don’t be fooled by the simplicity of the OODA Loop – it has the power and potential to change your life. As you start looking at your life through the lens of the Loop, you’ll gain insights about how to achieve success that you otherwise would be oblivious to. Follow the Tao of Boyd, and you’ll be able to do something in this life and not just be somebody. Science, Strategy, and War by Frans P.B. Osinga (The best resource on John Boyd’s work. It’s expensive, but if you really want to dig into the development of the OODA Loop, it’s a must read. Curtis Sprague of Dark Horse Tactical. His insights on how to apply the Loop in tactical situations was invaluable.